Thank you so much for the DVD, Facebook photos and gallery links. Your photographs are fantastic, and have made our memories of the day more vivid, more extensive, and more wonderful. We were so excited, after months of searching, to stumble across your website, and then really touched by your willingness and kindness to adapt your wedding package to our circumstances. Your photographs still remain the best we have seen, and we were so priviledged that you could come to our wedding and capture the most special moments in your unique way. Nina and you were brilliant on the wedding day (and run-up!) and helped everything to run smoothly with your immaculate planning. It is invaluble to have questions asked early on by someone who knows the intricate details of how weddings work, and we are really grateful to you for having made us think about things we hadn’t even considered. We both had a great time getting ready for the wedding. Nina kept the girls calm and happy in the bridal suite, capturing the most personal moments such as the last-minute trimming of the bridesmaid dresses underskirts, and the pictures taken by you as the boys got ready are wonderful, with some really moving pictures of Darren and his brothers. We really appreciated your subtlety and professionalism throughout the day. We hardly knew you were there at times, and Emily was genuinely surprised when it was revealed that the heart-stopping moments when the veil disappeared into the wind, pre-church ceremony, immortalised by Nina’s incredible photography skills. We cannot fully express how delighted we are with the photographs you have sent to us. All of the special moments of the day have been captured artistically and beautifully, and we’ve never had so many compliments…! 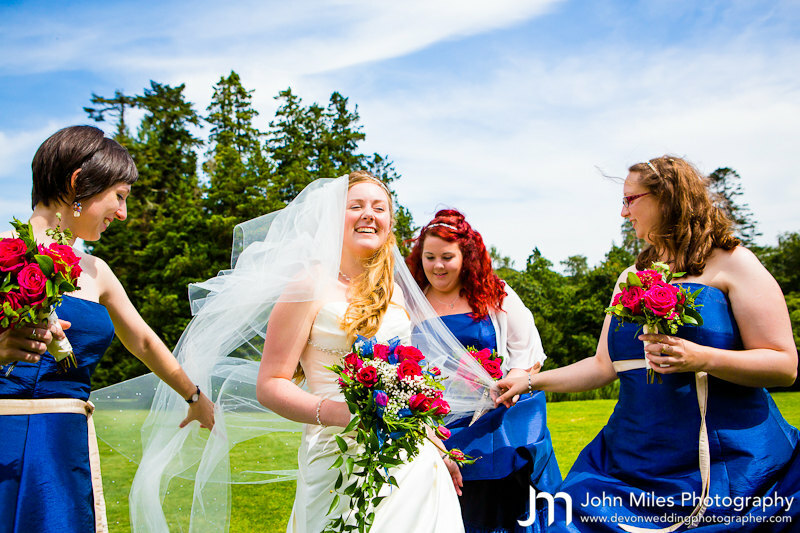 We would recommend you without a second thought to anyone in need of a wedding photographer. Our families thought you were wonderful, you were unintrusive at the church wedding ceremony, and even helped to coordinate new arrangements with the caterers and reception venue staff when timings went awry and the wedding car had a last minute switch over. Thank you so very much, you really did help to make our day perfect, and for that we will always be grateful.